HERAT (Pajhwok Afghan News) – A historical mosque in western Herat province – the fourth biggest mosque of the world – will be renovated with donations from Afghan traders, an official said on Friday. It reproduces the same stylistic model of the Sassanid Kasra Iwan in Ctesiphon. After the Anglo-Afghan wars much of the mosque was left destroyed. A program launched in 1945 rebuilt walls and rooms, expanded the north-eastern section of the mosque from a length of approximately 101 meters to 121 meters and replaced expensive material from all over the medieval Empires with cheap material. 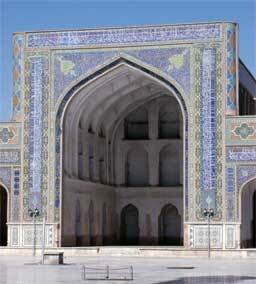 The Grand Mosque of Herat (مسجد جامع هرات), the city’s first congregational mosque, was built on the site of two Zorastrian Fire temples that were destroyed by Muslims. The mosque was begun by Ghurid ruler Ghiyath al-Din Muhammad b. Sam (غیاث‌الدین محمد ابن سام غوری, 1162-1202) in 1200 (597 AH), and continued after his death by his brother and successor Shihab al-Din (شهاب الدین). The Ghurids or Ghorids were a native Iranian dynasty freshly converted to Islam from Zoroastrianism which established rule over parts of modern day Afghanistan, Iran and Pakistan from 1148 to 1215. The dynasty succeeded the Ghaznavid Empire. Their empire was centralized in Ghor Province, in the heartland of what is now Afghanistan. It encompassed Khorasan in the West and reached in the East to northern India, as far as Delhi. Their first capital was Fīrūzkūh (فیروزکوه) in Ghor, which was later replaced by Herat while Ghazni (غزنه) and Lahore were used as additional capitals, especially during winters. The Ghurids were succeeded in Persia by the Khwārazm-Shāh (خوارزمشاهیان) dynasty and in northern India by the Mamluk dynasty of the Delhi Sultanate. “The Herat mosque is a historical place whose preservation is a collective responsibility of all residents; now businessmen intend to renovate it,” said the deputy chief of the renovation committee, Wali Shah Bahra, a former information director. The Herat Industrialists Union deputy head, Farid Ahmed Maulvizada, said around three hundred industrialists were willing to fund the renovation work. A number of traders have promised funds for the renovation of the main mosque in the provincial capital, deputy chief of the Herat Chamber of Commerce and Industries, Toryalai Ghausi, told Pajhwok Afghan News. “I’m proud that my donation has been accepted,” remarked businesswoman Najiba Sadat, who said another 50 of her colleagues were ready to help with reconstructing the mosque. According to Romila Thapar, writing about Mahmud of Ghazni, “Of the mercenaries, not an insubstantial number were Indians (obviously natives of Sistan ) and, presumably, Hindus. Indian soldiers under their commander, referred to as Suvendhary, remained loyal to Mahmud. They had their own commander, the sipasalar-i-Hinduwan, lived in their own quarter in Ghazni and continued with their religion. When the Turkish commander of the troops rebelled, the command was given to a Hindu, Tilak, and he is commended for his loyalty. Complaints are made about the severity with which Muslims and Christians were killed by Indian troops fighting for Mahmud in Seistan." During the period of Mahmud of Ghazni, much of the principality of Ghor was converted to Islam. The area was so remote that till the 11th century, it had remained a pagan enclave surrounded by Muslim principalities. It was converted to Islam in the early part of the 12th century after Mahmud raided it. According to Minhaj al-Siraj Juzjani, Amir Suri was captured by Mahmud of Ghazni, made prisoner along with his son and taken to Ghazni, where Amir Suri died. Amir Suri was a great king and most of the territories of Ghor were in his possession. But as most of the inhabitants of Ghor had not yet embraced Islam, It was also the last stronghold of an ancient religion professed by the inhabitants when all their neighbors had become Muhammadan. In the 11th century AD Mahmud of Ghazni defeated the prince of Ghor Ibn–I-Suri, and made him prisoner in a severely contested engagement in the valley of Ahingaran. Ibn-I-Suri is identified a Hindu by the author, who has recorded his overthrow. The Ghurid dynasty was also an indigenous Indian dynasty and arose after the Hindu population of Ghor was converted to Islam and the people Islamised. At the time of the Arab invasion of India which commenced with the invasion of Sistan in 642 A.D., even the area of Afghanistan was an integral part of Hind. In the words of the Persian historian Ahmad Ibn Yahya al-Baladhuri, author of Kitab Futuh al-Buldan ("Book of the Conquests of the Lands") translated by Francis Clark Murgotten as "The Origins of the Islamic State”, “As for ibn-Samurah, he established his rule over everything between Zaranj and Kishsh of the land of al-Hind, and over that part of the region of the road of ar-Rukhkhaj which is between it and the province of ad-Dhawar”.